With netbooks selling well in the run up to the holidays, I took a look at three of the latest entries into the fray, Hewlett-Packard's Mini 1000, Lenovo's IdeaPad S10 and BenQ's Joybook Lite U101. The reason for putting these three devices all together in one "Hand's on" story is because newer netbooks are starting to look a lot like what's already out there. This generation of Intel Atom-based netbooks has reached a certain maturity, with similar components, functions and size, as well as similar prices. The best bet for anyone considering buying one is to figure out as close as you can, what you want to do with it and what functions you want the most. Then find the best price. Netbooks are the computer industry's answer to the desire for more mobility in devices. Asustek Computer started the netbook craze with its Eee PC line of devices, which deservedly won a product of the year award from Forbes Magazine. The company's netbooks continue to be best sellers according to Amazon.com's rankings, which also include Acer's Aspire One and Samsung Electronics' NC10 among top-selling computing devices. The standard netbook today weighs around 1 kilogram, comes with a screen between 8.9 inches and 10.2 inches across the diagonal, and has a Web cam, a 1.6GHz Intel Atom microprocessor, 1G byte of DDR2 (double data rate, second generation) DRAM, USB and Ethernet ports and slots for memory cards and more. It typically has a variety of wireless technologies including Wi-Fi 802.11b/g and Bluetooth, runs either Microsoft Windows XP or a Linux OS, and has either a hard disk drive (HDD) up to 160G bytes in capacity or a solid state drive (SSD) with 8G bytes or more of flash memory. HP has made marked improvements with its second netbook, but the price tag may still be high considering the large number of rival devices with similar functions. I tested an HP Mini 1000 with an 8.9-inch screen, a 1.6GHz Intel Atom microprocessor, Microsoft Windows XP, 512M bytes of DRAM and a 60G byte HDD that ran at 4200 rpm (revolutions per minute). The company actually offers a variety of component options on the HP Mini 1000, including a 10.2-inch screen and SSDs for storage. One thing that really stood out about the HP Mini 1000 was the high definition audio, especially the sound quality of the onboard speakers. Songs play well, as does the sound on videos. Speakers may not be that important to some people considering netbooks are often used in coffee shops or other public places where headphones are more appropriate, but good audio is a nice touch on a device otherwise very similar to what's already on the market. Typing on the Mini 1000, another major consideration because netbooks are much smaller than regular laptop PCs, is great. The Mini 1000 has a keyboard 92 percent the size of one on a normal laptop. Keys are spaced out to make typing comfortable. One area I wasn't as impressed with was the trackpad. HP opted to use a trackpad similar to Acer's Aspire one, with the left and right mouse buttons at the sides of the trackpad instead of below. It's workable on a small device, but it's not as comfortable as having them below the trackpad. Battery life is one of the top considerations in a netbook. Some people may choose a 3-cell battery because it will make the overall device slightly lighter and less expensive, while others will prefer the extended life of a heavier 6-cell battery. For me, the cost and weight differences are far less important than being able to use the device for hours on end without needing a battery recharge. The 3-cell battery in the device I used ran for just over 2 hours of typing and Internet use, about standard. But the HP Mini 1000 apparently doesn't yet offer the option of a 6-cell battery, and so does not even come close to rivals in battery life. HP-Taiwan told me there will be a 6-cell version available that will raise battery life to 5 hours to 6 hours, but the company was not able to say when that product might be out. According to HP's Web site, it's still not available. Price is also an issue on the Mini 1000. 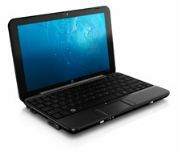 HP's Web site lists the basic configuration, with an 8.9-inch screen, for US$399.99, while the recommended model is $504.99. On Amazon.com, the lowest price for an HP Mini 1000 was $549.78. That's a lot more expensive than the Acer Aspire One's on Amazon.com, which carry similar components, for $384.99. Lenovo was late to the netbook market, but its first offering is a solid star. 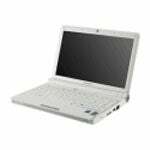 Its components are nearly identical to the standardized netbooks already on the market. I used an S10 with a 10.2-inch screen, a 1.6GHz Atom microprocessor, 1G byte of DRAM, a 160G byte HDD, and Microsoft Windows XP. The rest of its components are standard fare. The IdeaPad S10 booted in 36 seconds, exactly the same as the HP Mini 1000 I used and fairly standard for most netbooks using Windows XP. One thing about the Asustek Eee PC and Acer Aspire One I tried is both companies added embedded Linux OSs that open in about 8 seconds with full access to the Internet, e-mail, messengers, songs and other data. Windows XP opens in the background while you're already off surfing the Web. Asustek uses an embedded OS called Express Gate, while Acer uses one from Linpus. The typing pad on the IdeaPad S10 also works well with comfortable, well-spaced keys. The trackpad was a bonus, with the left and right mouse buttons at the bottom like in a normal laptop. One nifty trick on the trackpad was a way to enlarge and reduce text and pictures on the screen using gestures. Touching the trackpad with your thumb and forefinger, and then spreading them apart, you can enlarge text on the screen. Draw your thumb and finger together and the text shrinks again. The S10 I used was lightweight for a 10.2-inch screen model, just 1.1 kg, but that may be because it only had a 3-cell battery. Lenovo devices with 6-cell batteries aren't available yet, I'm told. Overall the IdeaPad S10 is a very standard device with a decent price on Amazon.com of $449.99. Few reviews have been written about this device from BenQ in part because they're not easy to find. The company announced them just a few months ago and they aren't available in most markets. I used one with a 10.1-inch screen that was on sale in Taipei for NT$14,999 (US$447.35). It had Windows XP, a 1.6GHz Atom microprocessor, 512M bytes of DRAM (though I was offered a free upgrade to 2G bytes) and a 160G byte HDD. The only really standout feature I found on the U101 was the display screen. The picture was among the best I've seen on a netbook, at 1024x576 pixel resolution with 16:9 aspect ratio. I watched a movie on the device via an attached DVD drive (no netbook so far comes with a DVD drive onboard because netbooks are so small). The keypad on the Joybook Lite was good and while BenQ placed the mouse buttons below the trackpad, it was one solid button instead of two. Two are better than one. BenQ does offer Joybook Lite U101s with 6-cell batteries, but the above price is for a device with a 3-cell battery.